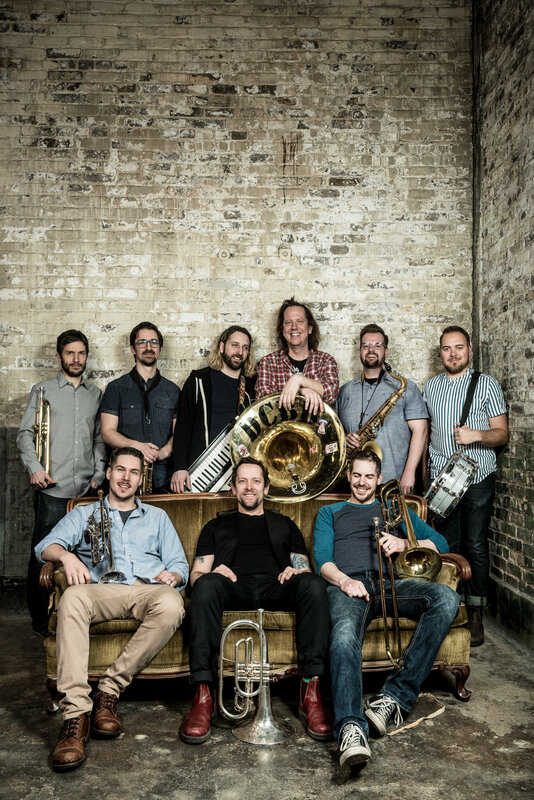 The Dirty Catfish Brass Band’s aim is to inspire, create and instigate – but, mostly, they just want you on your feet. Undeniably tight, yet reckless as hell, The Dirty Catfish Brass Band (DCBB) deals in powerful phrasing and performances drenched with rhythm. Invoking the sounds of the New Orleans brass tradition, the collective dares to reimagine the streets of a prairie city as one that is hot, alive, and brimming with soul. Based in Winnipeg, MB, the crew strives to surprise, challenge, tickle and pay homage to the New Orleans tradition by giving it a new audience in an unsuspecting locale. In true Louisiana tradition, these boys stick to the spontaneity of festivals, alleyway performance and all around late nights. The band doesn’t ask permission to play, and the crowd certainly doesn’t ask them to stop.